Record Number of Endangered Piping Plover Pairs and Fledges This Year Thanks to Enhanced County Efforts. Suffolk County, NY - August 17, 2018 - Suffolk County Executive Steve Bellone today announced that the County’s 2018 Piping Plover Conservation Program has resulted in a record number of successful piping plover pairs and fledges this summer while retaining recreational opportunities for outer beach enthusiasts at Smith Point County Park. In prior years, a vast majority of the outer beach area at Smith Point County Park was closed for public access to protect the plover breeding grounds. Realizing the importance of enhancing public access to the popular outer beach, the Department of Parks and Recreation updated its Endangered Species Protection Program with the goal of complying with federal conservation laws while fostering greater public access to the outer beach. When first launched in 1997, the Endangered Species Protection Program resulted in 32 pairs of plovers producing 28 fledges. This year’s numbers produced 62 pairs with 100 fledges, the highest number of fledges in the program’s history. Now that the fledglings are grown, the outer beach has been returned to full access to the public and four-wheel drive beach vehicle enthusiasts. Typical clutch is four eggs with each egg being laid every other day. Takes estimated 27 days for eggs to hatch, and additional 25 to 35 days for chicks to fly. Once hatched, chicks are mobile within hours. Parents do not feed chicks, therefore they are constantly on the move from shoreline to dunes in search of food. Once chicks become mobile, the need to protect becomes a greater challenge for the stewards and partial beach closures are necessary. However, with careful daily monitoring, the closures are lifted whenever possible to accommodate greater public access. The implementation of protective measures such as installing string fencing, barricades and predator enclosures, careful monitoring and Park Ranger enforcement of restricted areas enable the fledging process to progress naturally and undeterred. The loss a nest due to human or predator intervention may result in the plover pairs re-nesting thus re-starting the nest-to-fledge cycle. 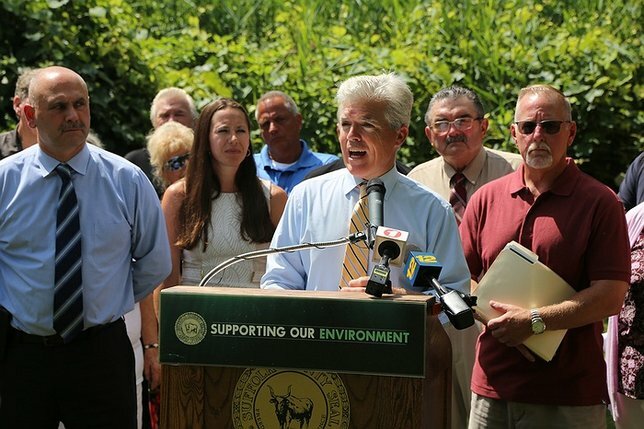 Subject: LongIsland.com - Your Name sent you Article details of "County Executive Bellone Announces Successes Of 2018 Piping Plover Program At Smith Point County Park"